There are many things we can learn from those who have gone before us. My personal temptation is to think that those from earlier times are not as smart because we've advanced in technology and even some forms of learning. However, that is simply erroneous thinking. Many who've gone before us are more intelligent and are actually the pioneers of the learning we have today. Richard Sibbes was a Puritan pastor that seemed to toe the line well during a time that was full of controversy. Both sides wanted to claim him and he was often said to hold positions that weren't true of him. Mark Dever seeks to clear the air through an in depth exploration of Sibbes history and theology. The most helpful part the reader will find in this book is clarification of who Sibbes is and the "why" behind his writing and preaching. Having read this book, I feel as though if I were to read works by Sibbes, I'd have greater understanding of where Sibbes is coming from. Dever put in a lot of work to really clarify Sibbes history and theology. Having context always helps the reader gain greater clarity. My greatest critique of the book would be Dever's passive writing. He simply writes to inform, which some readers may like. I personally would have enjoyed Dever's take on some of Sibbe's theology. I would have loved to have known Dever's opinions on Sibbes and wished he would've inserted himself a bit more into the book. This is a minor critique and I may be alone in these wishes. 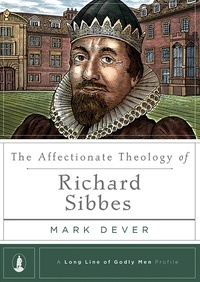 The Affectionate Theology of Richard Sibbes is a great biography for anyone interested in the Puritans. Mark Dever has made a great contribution in writing this particular work as Sibbes was a Puritan surrounded by controversy and mystery. Dever does all of us a favor by shining light where there was darkness helping us all understand this great Puritan pastor better.